Despite some warnings from industry honchos about the potential downside pressures from a continued government shutdown,1 defense and aerospace stocks have outperformed the S&P 500 (SPX) by a healthy margin so far this year (around 9.2% vs. 5.4%). 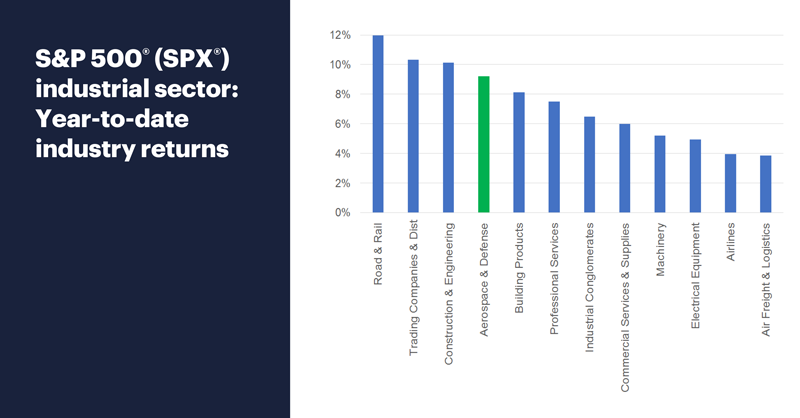 That bullish performance will be put to the test in a few days as several high-profile stocks, including Boeing (BA), Raytheon (RTN), Lockheed Martin (LMT), General Dynamics (GD), and Northrop Grumman (NOC), release their latest quarterly numbers. 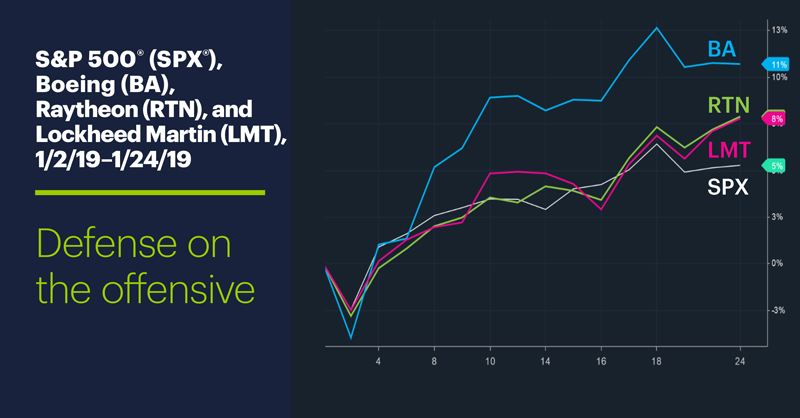 The following chart compares the performance of three of these stocks—BA, RTN, and LMT—to SPX since the beginning of the year. With this many marquee stocks in the same industry compressed in the earnings calendar, the results of the initial reports (LMT kicks things off on Tuesday) could have a domino effect on the others, and may go a long way toward determining whether the industry will continue its rebound—and whether the broad market can launch another upswing. Market Mover Update: Semiconductor stocks, including Micron Technology (MU, up more than 8% intraday), got a bump yesterday in the wake of positive earnings from a few chipmakers on Wednesday. Despite closing slightly higher, the S&P 500 (SPX) remained in a mild pullback yesterday, screwing into a low-volatility inside day (lower high and higher low than Wednesday). Today’s numbers (all times ET): Scheduled but unavailable because of the government shutdown—Durable Goods Orders (8:30 a.m.), New Home Sales (10 a.m.). Today’s earnings include: AbbVie (ABBV), Air Products (APD), Colgate-Palmolive (CL), D.R. Horton (DHI), Lear (LEA), NextEra Energy (NEE), Synchrony Financial (SYF). 1 Investor’s Business Daily. Boeing Warns On Government Shutdown Amid These Ominous Signs. 1/24/19. 2 Deloitte.com. 2019 global aerospace and defense industry outlook. December 2018.